Progress on my kill team has slowed down to a crawl, as work and real life suddenly have reared it's ugly head after summer vacation. 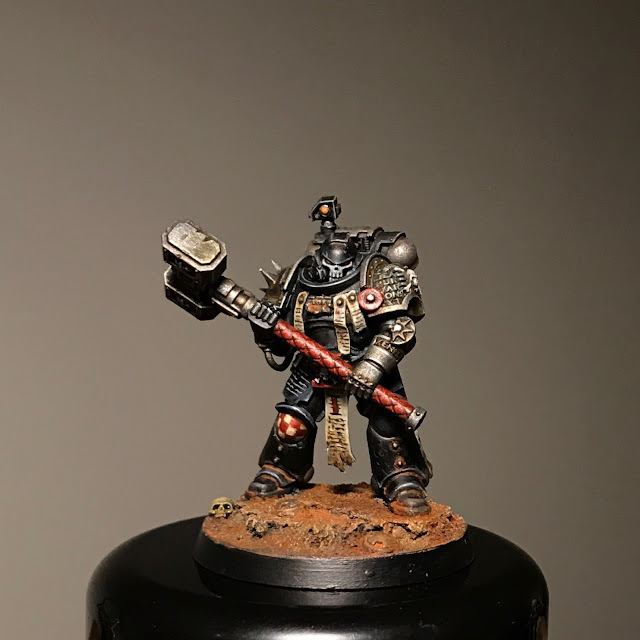 I have managed to build a fifth member for my kill team though - the squad zealot and chaplain in training, armed with a mighty heavy thunder hammer. I almost changed the head of the hammer as it's just so ridiculously oversized, but in the end I decided to keep the thing out on account of it's utter badassedness. The crew is sorta kinda battle-worthy now, clocking in at 85-isch points. I will make a few more marines though to have some options when fielding them - namely a sniper and a heavy gunner. 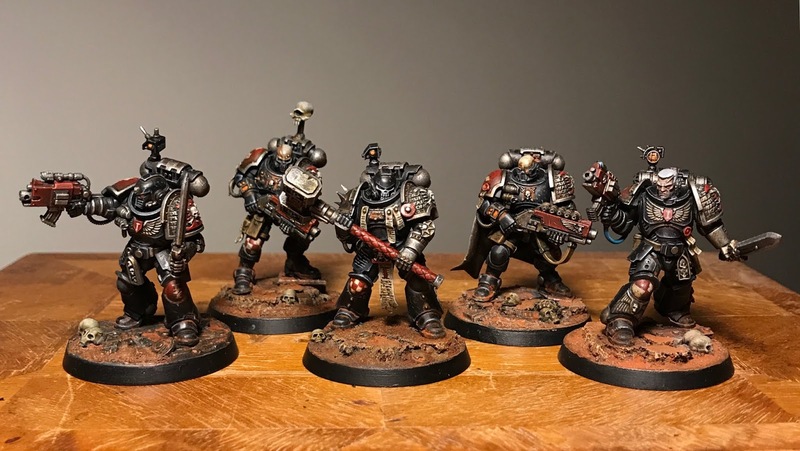 Battle Brother Komeda (combat specialist), Battle Brother Desplat, Sergeant Dukas (leader), Battle Brother Silvestri and Battle Brother Zimmer (zealot). You’re seriously the first one to get it! Battle Brother Steiner will be next! Wow those look incredible! Absolutely top notch work, well done! Thanks Dai. Yeah - the hammer lends him a certain heft. These are sublime! When fixing the marines to the cork underfoot, did you pin them or just superglue them on? Cheers! I just superglue them to the cork - the bond is really sturdy so there’s no reason to pin them. That looks superb. The hammer is just right. These guys are gorgeous. Such a strong colour palette, and the weathering is sublime. Each one has such a great sense of character. 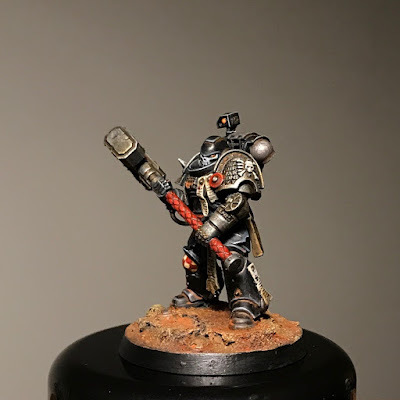 The Deathwatch bits look so good on the Primaris frames as well. This is gorgeous work! Well done. Am very keen on building my own truescale Deathwatch using the Primaris marines. 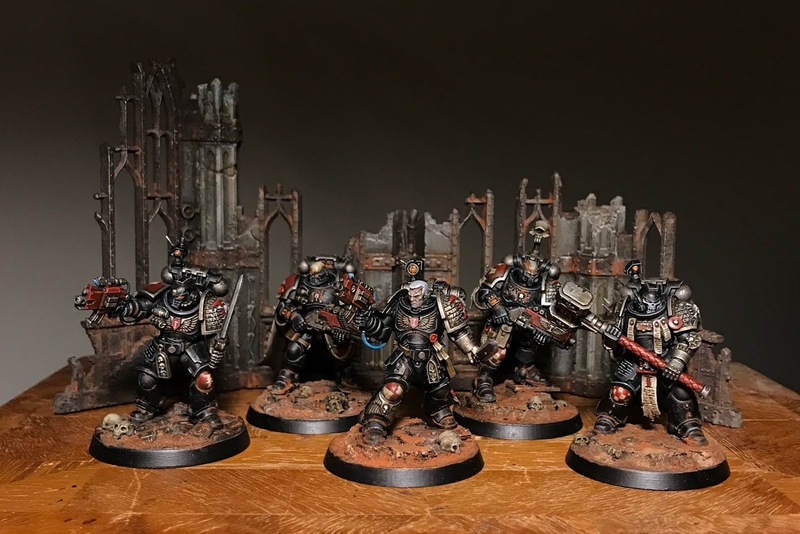 Do the Deathwatch upgrade bits fit perfectly with the Primaris frames, or did you have to do any cutting or filling with green stuff? My own conversion skills are non-existent. That's a beautiful model, man! Love the colours, and the helmet is perfect for a chaplain. And to be honest, that hammer is not so disproportionate. It might be ridiculous on a normal marine, but on a primaris it looks like a thunder hammer resized for them. It still is a bit ridiculous, but it works! I absolutely love your blacks, how do you usually do them? Cheers mate! Basically I spray the model black and then give it a semi zenithal spray of grey. When that’s dry a nuln wash follows and then the palets are painted black, leaving the rim grey as a highlight. I then higligt with administratum grey and light gray. To top it off i give it all a light glaze of guilliman blue to give it a cooler tone. It’s a bit less straightforward than that of course, but it’s more or less how I do it. 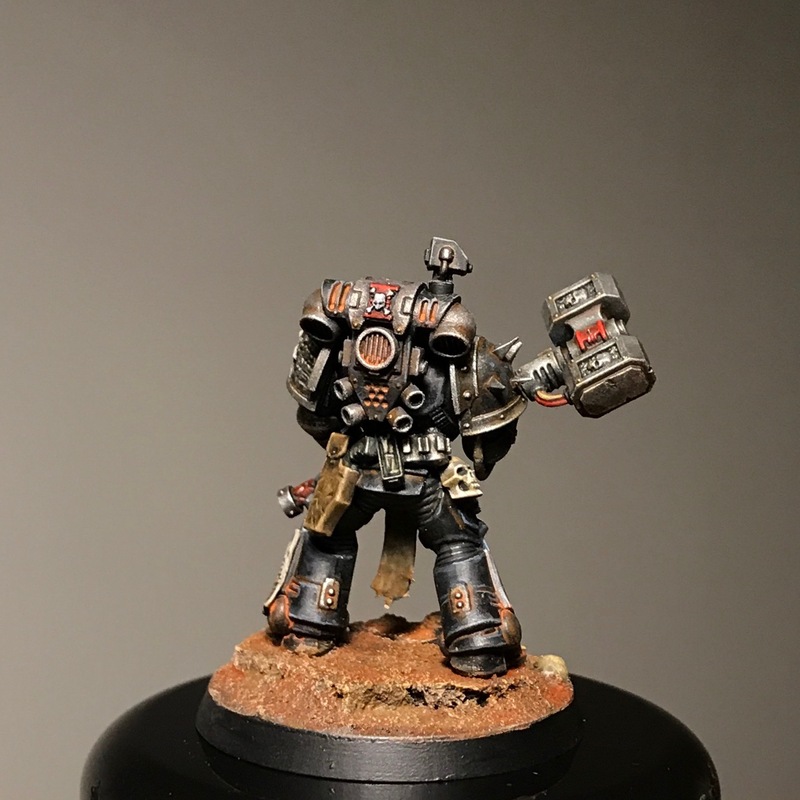 Seriously, though: The Killteam is looking fantastic, and the chaplain in training is such a brilliant model, with that grounded, static pose. Maybe my favourite so far, and one of the very few models where the Reiver skull helmet really works. Fantastic work all around! Cheers Krauty! I’ve been looking for a way to incorporate the reiver helmets on a model and this seems to be the way to go! Watch Movies and TV shows.